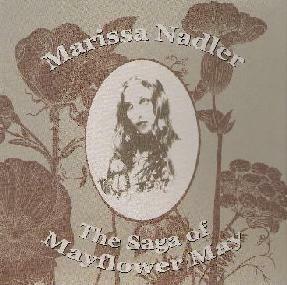 Marissa Nadler - "The Saga of Mayflower May" / "Ballads of Living and Dying"
This is out on the edge of the kind of music we generally review here at Aural Innovations, but am I ever glad these two CD's landed on my desk. 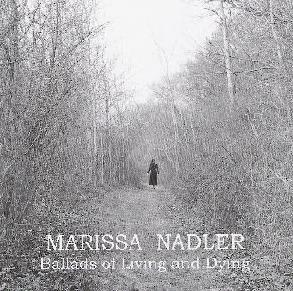 On her debut album, Ballads of Living and Dying, Marissa Nadler plays a beautiful and haunting style of folk music, balladry at its heart, with slight British folk influences. The sparse arrangements, consisting of mostly just Marissa's acoustic guitar and voice give this the feel of those wonderful late 60's, early 70's folk albums by the likes of Buffy St. Marie and Linda Perhacs. But Marissa writes all her own material, so everything sounds fresh too. Add to the acoustic guitar the occasional additional instruments such as the sadly wailing electric guitar of Fifty-Five Falls, or the banjo on Days of Rum and you get a slight psychedelic touch to the proceedings as well, which is quite welcome. And in the case of a song like Annabelle Lee, which has an e-bowed electric guitar on it along with Marissa's acoustic guitar, it becomes a dreamy and lingering piece of music, one of the standout tracks on the album. Occasionally, some of the tracks begin to sound a little similar, which is always a problem on albums of music with such sparse arrangements, but it's still easy to just close your eyes and let it flow past you, as if it were all part of a longer piece of music. Her latest CD, The Saga of Mayflower May, features the same strong song writing, in fact, possibly even stronger than on her debut, she sounds just that little bit more self-assured and confident in her style, and this helps to avoid that samey kind of sound which slightly hampered her debut. In fact, it helps it so much that it allows the arrangements on this album to be even sparser, with just acoustic guitar on most tracks, although there are still a few tracks to feature other instruments, such as the tin whistle on Little Famous Song or the Hammond organ on Mr. John Lee, tasteful inclusions that keep things interesting. And as always, there is Ms. Nadler's breathtakingly beautiful voice, which remains as distinctive as those artists I mentioned earlier in the review. I think it would be interesting for Marissa Nadler's striking voice, accomplishing playing, and knack for haunting melodies to be heard in a band context, but for now, these two solo efforts are evocative charmers that deserve an enthusiastic audience. For more information you can visit the Marissa Nadler web site at: http://www.marissanadler.com. Visit the Eclipse Records web site at: http://www.eclipse-records.com.